Archive by Category "Positive Discipline"
I absolutely love Positive Discipline! Click here to visit Positive Discipline If you haven’t checked out any of their books or website – do it now! 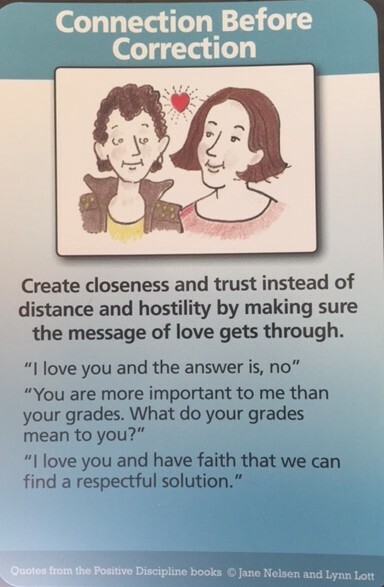 They have the best advice (in my opinion) for how to help behaviors in a way that is kind AND firm at the same time. 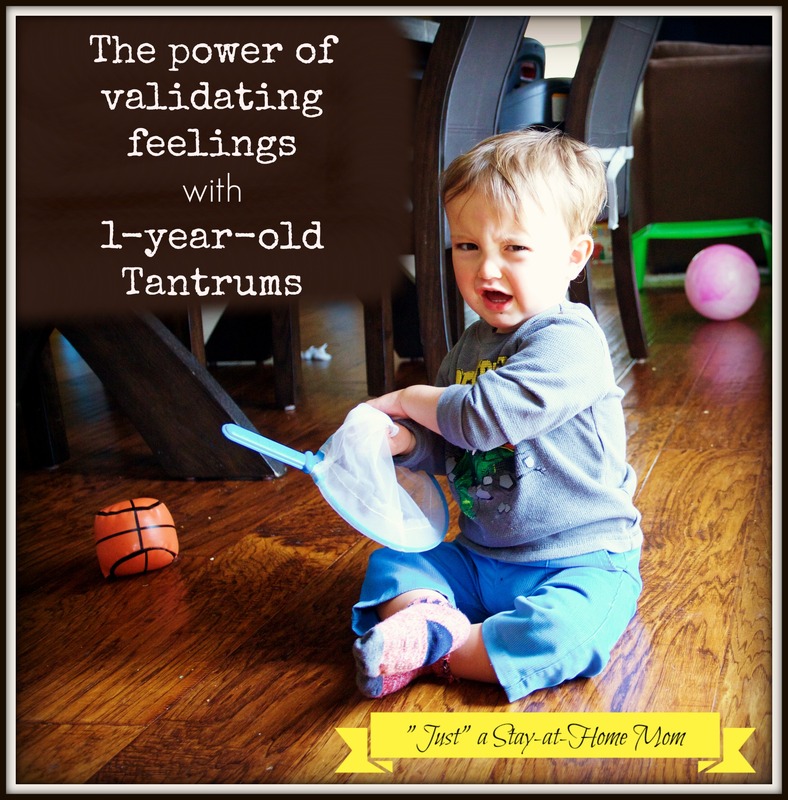 Today, I want to share some ideas on how to help a 1-year-old when they are starting to cry or scream about something they don’t like (using Positive Discipline’s “Validate Feelings” tool card. I don’t know about your child, but mine cries often over very small things. 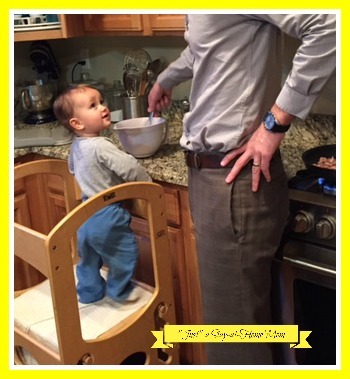 If he could talk, he would likely be saying things like, “I don’t want to sit there”, “I hate putting my coat on”, “I don’t want to get in the car”, “I’m not sitting in this high chair”! “Oh boy. You are frustrated that we are getting shoes on right now. You do not like putting shoes on. I hear that (while child is crying screaming). It’ ok to be frustrated. Take a minute to just be frustrated about that. I’m here. I’ll give you a hug. 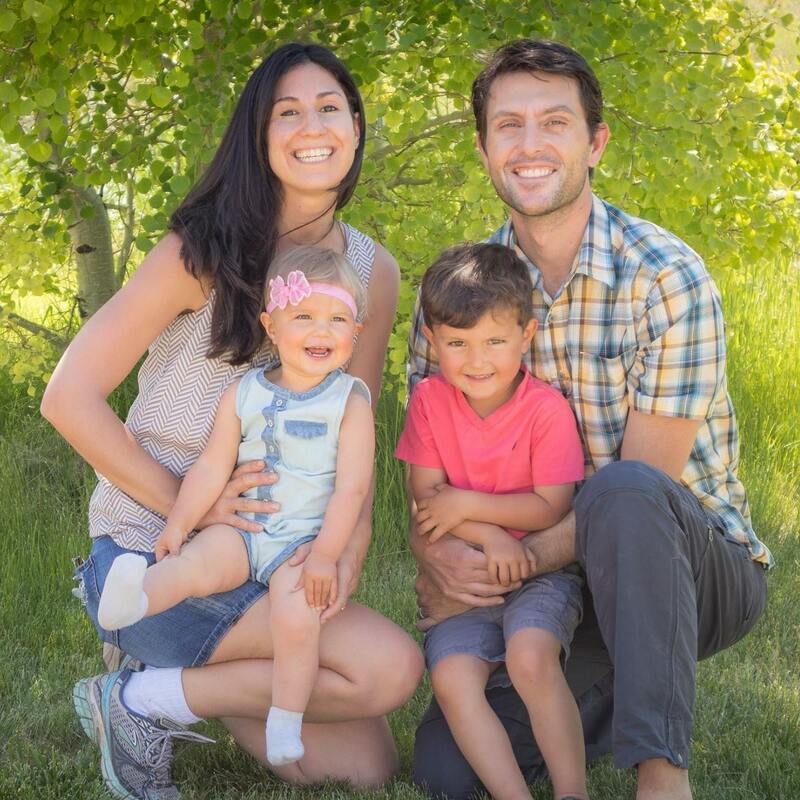 I don’t like doing things sometimes too.” Meanwhile, I pause the putting-on-shoes process to just connect with a hug, cuddle and soft voice, hoping my calmness can wear off on my child. Usually this works to calm his cries screams within 1-2minutes. In a moment of screaming 1-2 minutes can feel like FOREVER, but it’s really worth the wait. It’s not that long at all when you think of the lifelong benefit you are giving your child, helping him to feel their feelings are valid and helping them understand and manage their emotions. Empathy has the power to really take the sting out of most difficult situations. It doesn’t make it perfect. The child isn’t going to smile and say, “Ok. I am completely happy now about getting my shoes on”. BUT, they are more likely to be able to move past the emotion to a level of calmness where you can distract them with something else to focus on and move forward. Once that initial flare-up has died down, I then say something like, “Here. Could you hold my keys and be a helper?” (while then putting the shoes on). Hope you see great results! **Disclaimer: Remember, this is not a 1-time fix. 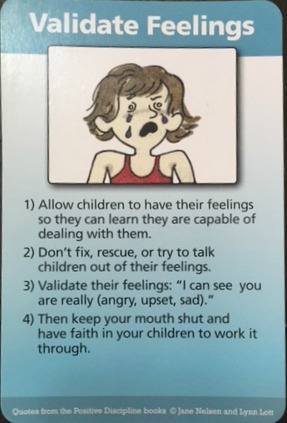 This is a tool to use over and over again throughout the tantrums years for better results towards helping your child understand and manage their emotions. Expect to repeat these steps 5-20+ times a day (depending on the day! 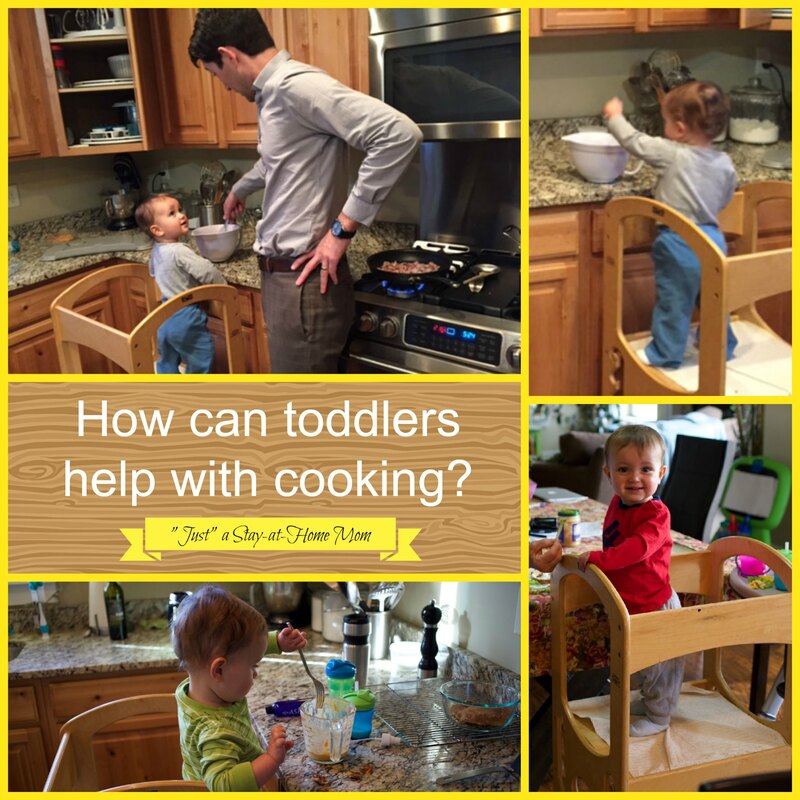 );-) Would love to help you trouble-shoot if you aren’t seeing it help your 1-year-old’s tantrums. This is NOT your typical morning/bed-time routine chart, and that is what I LOVE about it! 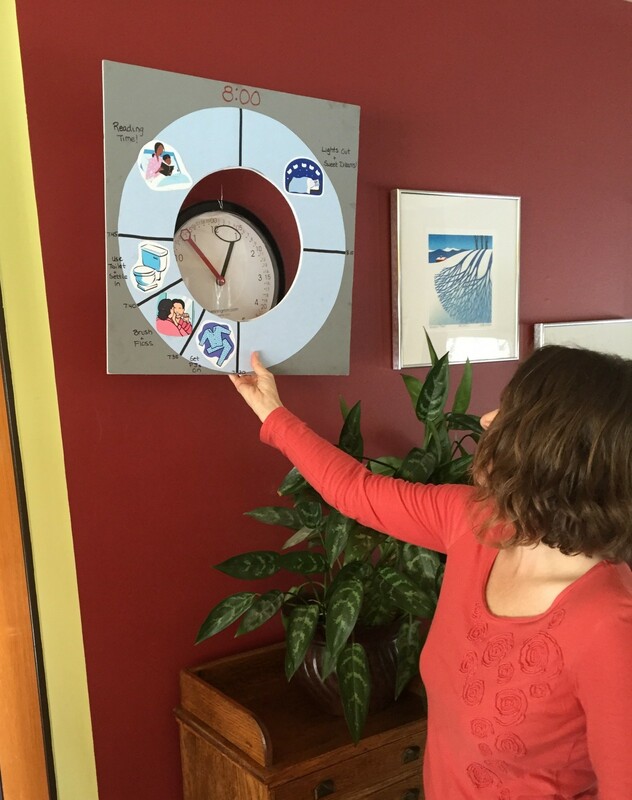 When I recently was interviewing an 11-year SAHM, Kerry, I noticed this genius idea on her wall and begged her to be able to share it. I have never seen a chart used like this and I LOVE it! If you have children that are school-aged, this is a must-have. 1. A visual clock. Kerry purchased this awesome Teaching Hands Clock (from www.difflearn.com), which is specially designed to help children understand what hour and minute it is. 2. 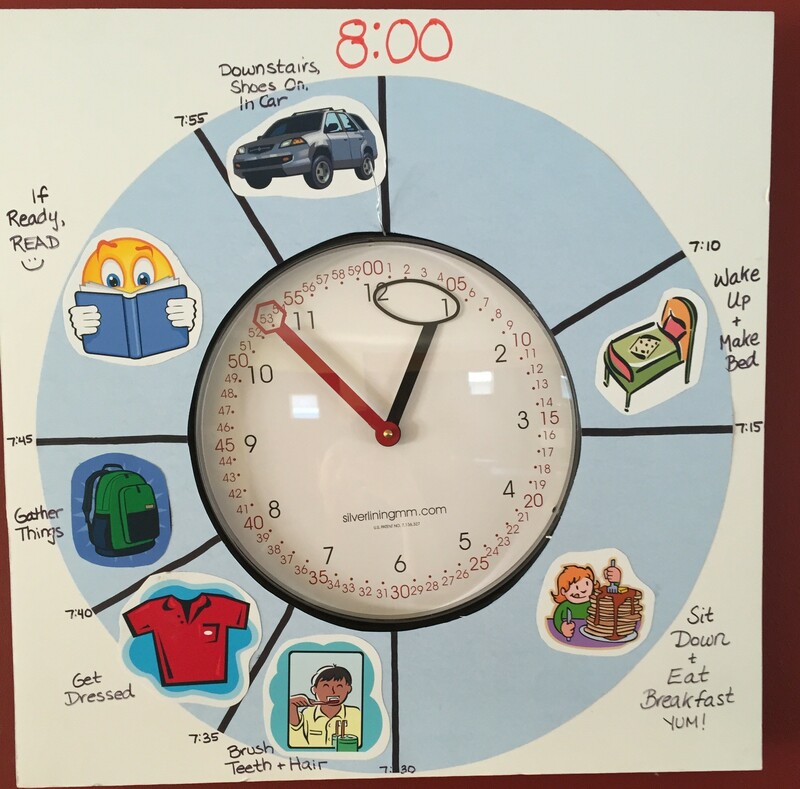 This awesome 2-sided routine chart to help your child know the steps needed to get out the door (or to bed) on time! 1. 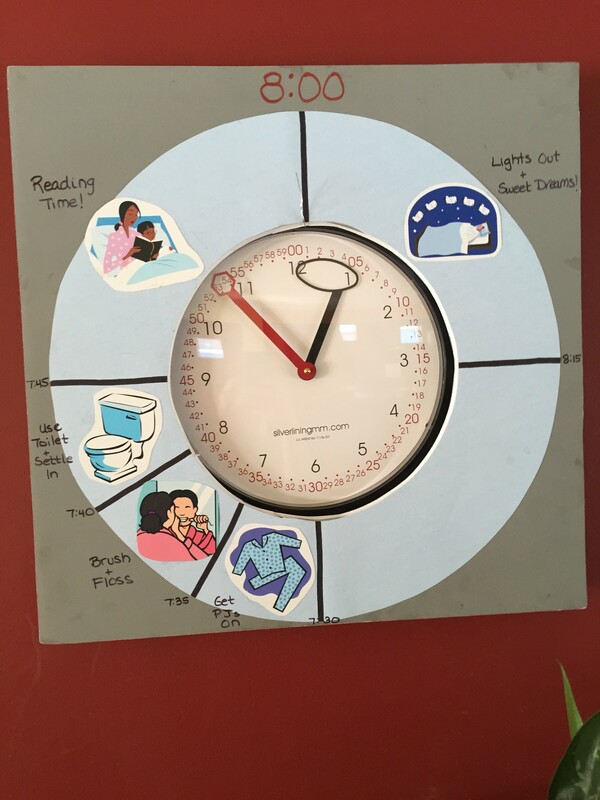 Pictures used to demonstrate each activity help the child to clearly visualize what needs to happen while the red minute hand is in that section of the chart. 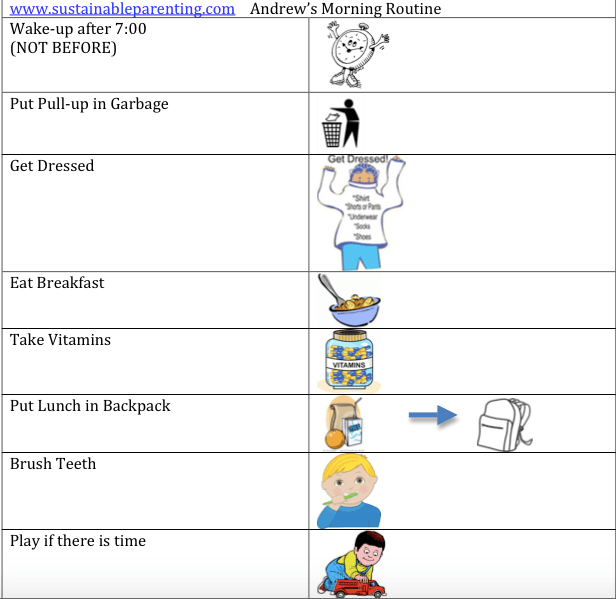 Morning Routine chart to help children self-monitor so they get out the door by 8am! 3. It is helping your child to understand time better as they walk through and are aware of how fast 5 or 10 minutes goes by. Super cool reversible morning/bedtime chart! This clock is designed to be reversible. So, you create a sort of hook on top of your clock with a twisted up wire hanger, and then you simply hang up the Morning Routine side in the AM, and flip it to the Bed-Time Routine side in the PM. For those of you who aren’t feeling crafty, or just don’t have the time to make one of these yourself, I’m gonna work on making a template you can download. Until then, here is a template of a Routine_chart_for_kids my sister used with her 4-year-old. Here is part of the chart, but I recommend downloading it to see the whole chart. This is a tiny example of using the Positive Discipline tool of “Connect before you correct”. 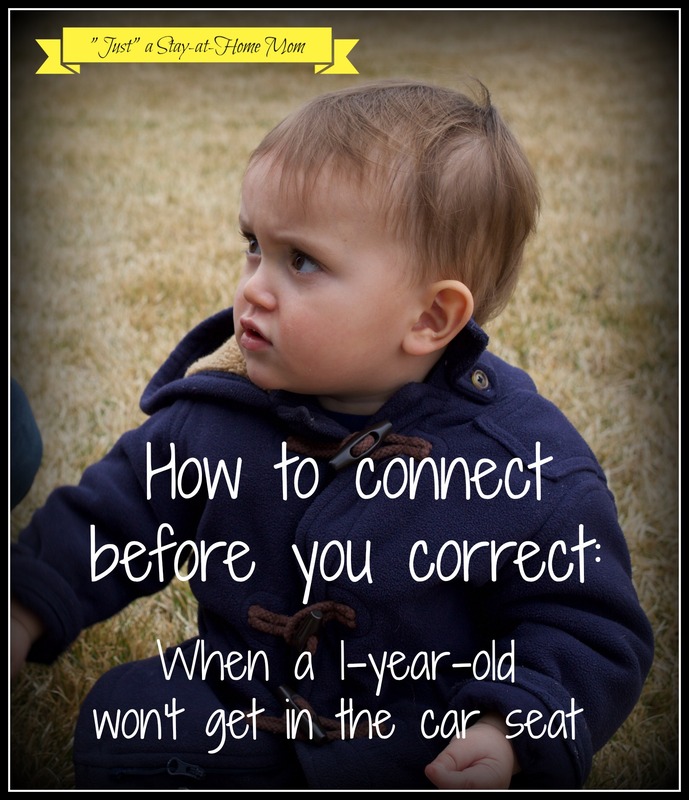 I am NOT saying this will always work, but I had a tiny success moment the other day and thought I would share it, in case it could help another parent. We were leaving Music Together class (where my 1-year-old had just had a ton of fun), and he was not interested in going home. We got to the car and I couldn’t quite open the car door to get him into his seat because the car next to us was about to pull out. So, I set him down in the grass in front of our car and let him walk around in the median a bit (holding my hand). *This may have not helped our situation because he loves to be outside walking around. Anyway, once the car was gone, I opened the car door and tried to sit him in the car seat but was greated with a very hefty hip thrust forward, arching his back and screaming. Yeah. Loud and clear little buddy. You do not want to get in the car. Got it. I was annoyed, but did my best to talk slowly and with a calm voice (not easy in these moments). After a moment of looking around and watching another car drive away, I sat him back in his car seat and talked about the fun that was ahead. “Dad will be home when we get there, and we will cook dinner together and get to play together.” His body softened into the seat and we were able to move forward as we normally do. So thankful for this tool from Positive Discipline. I would love to hear comments of what you do when you get that hip thrust out of the car seat (or other tough moments). I know they will come again!